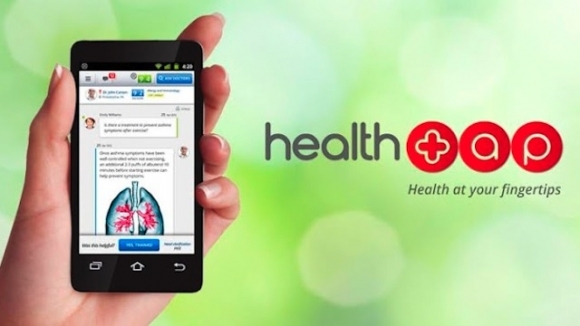 San Francisco-based HealthTap (@HealthTap) has unveiled a major overhaul of its physician-patient social network with a new significant focus on mHealth. The update includes a suite of new apps for the iPhone, iPad, Android and the web. Since its launch last year, HealthTap has raised $14 million from investors including Mayfield Fund, Mohr Davidow Ventures, Eric Schmidt’s Innovation Endeavors, Esther Dyson, and more. HealthTap was founded by Ron Gutman (@RonGutman), formerly the CEO of WellSphere, and curator of TEDx Silicon Valley. HealthTap already offers its ePatient users access to a directory of 1 million physicians across the country, and has now launched a new Q&A service with 12,000 participating US-licensed physicians, which patients can use to securely send HIPAA compliant text messages to physicians with the option to include images, health records, and more. The initial text costs $10 and each follow-up message costing $5/each after one freebie, which is certainly more than a typical SMS conversation, but also certainly less than an average office visit. Patients are also free of the hassles associated with office visits, such as wait-time, travel, etc. Each of these 12,000 doctors has a built-in quality score associated with their name and profile the company bills as a sort of medical equivalent of a FICO Score, which incorporates both publicly available information and peer reviews from other doctors. Up-to-date and personalized health information: Follow topics, doctors, and questions to stay current on the issues that matter most to you. Transparent doctor-to-doctor ratings: View each physician’s “DocScore,” a FICO-like quality score for doctors that incorporates publicly available data and doctor-to-doctor peer review. Doctors also rank each other on expertise within specific topics. Directory of over one million doctors: Use simple, everyday language to find the best doctors in the HealthTap network and in the world’s most comprehensive mobile doctor directory. In-person virtual appointments: Connect with doctors in person using in-app appointment requests, direct messaging and phone calls. Secure private digital health file: Have full control of your personal health records, available and transferable anytime, in a secure and private environment. Store and safely share rich health media: Share health records, photos, and documents with doctors securely and privately.